What makes up a tooth…. The ingredients in a horse's tooth are not different from that of our own. They are made up of three different materials; cementum, dentin and enamel. Each has its own function in the structure of the tooth. Enamel is the hardest and most dense material in the body. Enamel although extremely resistant to friction, it is also brittle and easily be broken off. Dentin is the major ingredient in the tooth. It is a cream colored and softer substance than enamel. Unlike that of enamel; dentin is always being produced in the adult tooth. Cementum shares characteristics with normal bone tissue and is also cream colored like dentin. This is the softest material in the tooth. There is also a pulp chamber in which blood vessels are able to travel and carry nutrients to the tooth. Some teeth have a single chamber, two chambers or even up to six pulp chambers. The pulp chamber(s) are usually 1-2mm below the chewing surface at all times and can sense when it needs to recede as the tooth erupts. Tooth eruption, what does it mean? 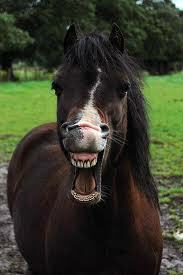 Well unlike it is or was believed, horse’s teeth do not continuously grow all of their life. They do develop up until a certain age and then once the tooth is fully developed that will be the amount of tooth they will have available for the rest of their life. It then spends its time erupting through the gum, as needed to keep in contact with the opposing tooth (i.e. - the bottom first molar erupts to keep in contact with the upper first molar). This keeps the teeth in constant contact for the grinding of food. There are 2 different terms used for the sections of the tooth. The first one is the tooth that can be seen outside of the gum; this is called the visible or clinical crown. The second term is for the tooth waiting under the gum; and this is called the reserve crown. On average the adult horse’s tooth erupts 2-3mm each year to compensate for the constant grinding of food (younger horses erupt faster). On average most adult horses have a total of 75-100 mm of total tooth to use throughout their life time. Under normal conditions and wear it is possible that a healthy horse’s teeth should not wear out for 25-30 years. How does a horse chew? One thing to start with is not like its human owner. We chew up and down; horses do not. The process starts when they use their very dexterous lips and pull the forage/food in between their incisors. Their bite force is approximately 2% of their body weight. Once the front of the mouth is full, the grinding begins. The food material passes over the molar arcades and follows a similar trip as if it would be spinning like an auger. This is due to the three chewing phases. The opening phase is when the lower jaw is pulled away from the upper jaw so that molars are separated for a period of time. The second phase is the closing phase, the lower jaw moves sideways and upward. The third phase is the grinding phase; this is when the lower jaw moves sideways back to the central position; thus grinding the food material between the molars. All six cheek teeth work as a single unit to grind the food and in essence the food material only passes over each tooth once. The food is rolled all along the mouth into a rope like shape and the cheeks keep the material in mouth as it rolls and gets ground up. The rolling is also helped by the palatine ridges and the tongue pushing up into the roof of the mouth. There are other factors that will keep your horse healthy and happy, so no floating is not enough for all cases; but good dental care is high on the list. It is good practice to have a great health care team (Vet, Farrier, dentist and body workers). It is starting to be proven that floating/correcting the teeth, proper trimming of the hooves, posture and diet all go hand in hand in the well-being of horses. If the posture isn't good and the horse is not balanced; the teeth will continue to wear in the same way they did prior to floating. The position of the head and upper neck, and the position of the TMJ are rich with *proprioceptors and transmit information to the control centers that generate correct posture. Distorted information from these areas can cause abnormal compensation in the posture and can cause sore backs, lameness in the hind end, as well as heel pain. These things can lead to additional problems like premature arthritis and damage to the navicular bone. Good balance between the incisors and molars are a huge help in getting back to a better posture because it helps the TMJ, head and upper neck send better information and in turn a better posture. Wolf teeth were once another molar long ago and are now only a remnant of that molar instead. This is due to the evolution of the horse. Wolf teeth can sometimes cause problems once a horse goes into training and has a bit placed in its mouth for the first time. This tooth can be irritated by bit pressure and if it is causing performance/training issues, it is wise to remove it. On average this is a pretty easy and quick procedure. If it is not causing any discomfort or issues, it is ok for it to remain if preferred. Aging isn’t an exact science and with experience a good approximation of age is possible. The older the horse gets the larger that approximation will be due many factors that can sometimes alter normal wear and eruption. These factors can include: lifestyle, diet, neglect or injury. Aging can be determined by knowing and recognizing the normal eruption of the teeth, normal wear and anatomy of the tooth. The normal eruption times of the incisors are well documented and can be a good way of determining age. Another factor in aging that comes into play when they are present is the canines and this is based on their eruption time. Something called the Galvayne’s Groove* on the corner incisor is also taken into consideration. This factor though can be a tough call to use for anything other than approximate age. It can differ from side to side and can sometimes not be distinct enough to use as a gauge. The best course of practice it to take into account the many factors to get an average age. **Galvayne’s Groove – is a brown streak on the upper corner incisor tooth and is said to first appear near the edge of the gum when a horse is about 10 years old. It is named after a Mr Galvayne, who wrote a book on ageing horses in Victorian times. DISCLAIMER: All information contained here on Sweet Retreat Farm is intended for educational purposes only. It is not provided in order to diagnose, prevent or treat any disease, illness or injured condition of the body and the author, publisher, and contributors accept no responsibility for such use of this information. If anyone's animals are suffering from any disease, illness or injury should consult with their veterinarian.